The Gem Project, Inc. - We Captivate To Educate > Team Journal > Public Discussions > How do we cultivate compassion? 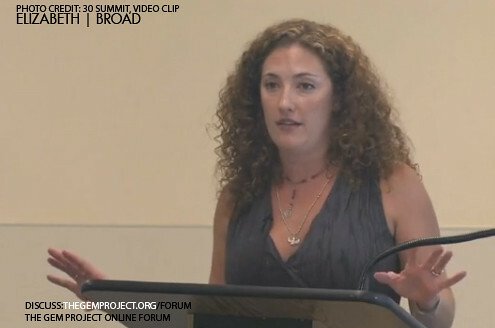 Credit: 30 Summit Video Cap. Elizabeth expresses her views as a passionate activist about the global economic crisis and the need to escape the fear based mentality, which binds most people from being architects of social change. She opens up by revealing her desire to explore the ideas of motivation and inspiration. She probes the question, “What inspires you ?” to her guests of activists and experts. What really inspires them ? What makes an activist any more different than the rest of us? What can be learned from this? Why can’t we all be activists of what we are most passionate about? Elizabeth advises a multitude of possible solutions that can ensure a safer future and stay here on Earth. She first talks about her top two concerns, climate change and the economic crisis. She believes that we all should be taking a more aggressive approach in lessening our fossil fuel dependence. While simultaneously unearthing new details about the economic crisis. How do we cultivate compassion and tolerance? How do we go about inspiring people to become “change agents”, while making it as diverse as possible ?